Search "red" 106 results have been found. Turqoise/Black Dots martingale or snap-relase buckle dog collar splashed with a loads-of-personality color combo of dots. Ridley martingale or snap-relase buckle dog collar displaying a pomegranate colored Celtic design on silver gray. Red Ladies martingale or snap-relase buckle dog collar displaying a woven lady bug trim on black satin. Red Bandana martingale or snap-relase buckle dog collar is an old time favorite which will never go out of style! Glasgow martingale or snap-relase buckle dog collar dressed with a lighter tone plaid. Carlisle martingale or snap-relase buckle style dog collar decked out with an engaging blue, green, red and white plaid. Inverness martingale or snap-relase buckle dog collar complete with a harmonius plaid in shades of dark green, red, yellow and lines of white. Fall Diamonds martingale or snap-relase buckle dog collar featuring a diamond pattern in autumn shades. Spruce martingale or snap-release buckle dog collar decorated with a rich green, red and white criss-cross pattern. 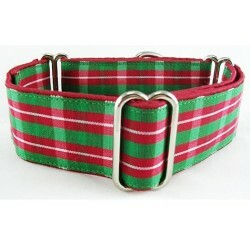 Scottish Christmas martingale or snap-buckle dog collar decorated with a cheerful red, green and white plaid! Castle Chrismas martingale or snap-release buckle dog collar decorated with a luxurious blend of festive colors just right for the holidays. 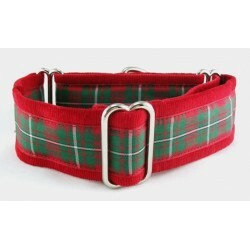 Highland Holiday martingale or snap-release buckle dog collar decked out in a traditional red, green and white Tartan. Poinsettia floral martingale or snap-relase buckle dog collar displaying festive flowers of the Holiday season. 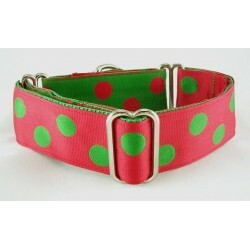 Christmas Dot polka dot martingale or snap-relase buckle dog collar decked out in red and green. 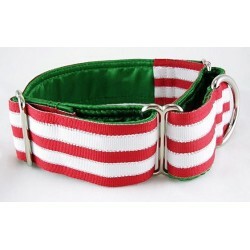 Candy Cane Green martingale or snap-relase buckle dog collar wearing a red and white stripe grosgrain ribbon and green satin lining. Rosalee in Red is a red and black floral martingale or snap-relase buckle dog collar complete with a sparkle of gold. Festive Flamingos martingale or snap-release buckle dog collar topped with Pink Flamingos modeling Santa Hats. 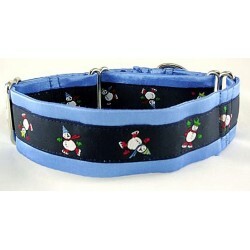 Skatin' Snowmen martingale or snap-release buckle dog collar wearing a wintery trim featuring cute, colorful, skating snowmen. 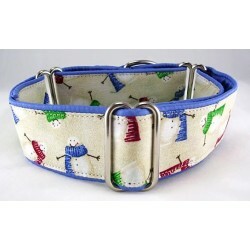 Shivery Snowmen martingale or side release buckle collar decorated with a hand turned fabric displaying fun little snowmen. Deck and Dice martingale or snap-relase buckle dog collar decked out with a gaming flavor all its own. Jaspar martingale or snap-relase buckle dog collar complete with rich jewel tones and accents of gold. Red or White martingale or snap-buckle dog collar surrounded by wine glass filled with your wine of choice. 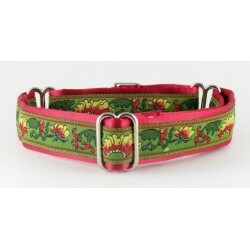 Mayfair, a cheery martingale or snap-relase buckle dog collar in shades of red, yellow, and green.